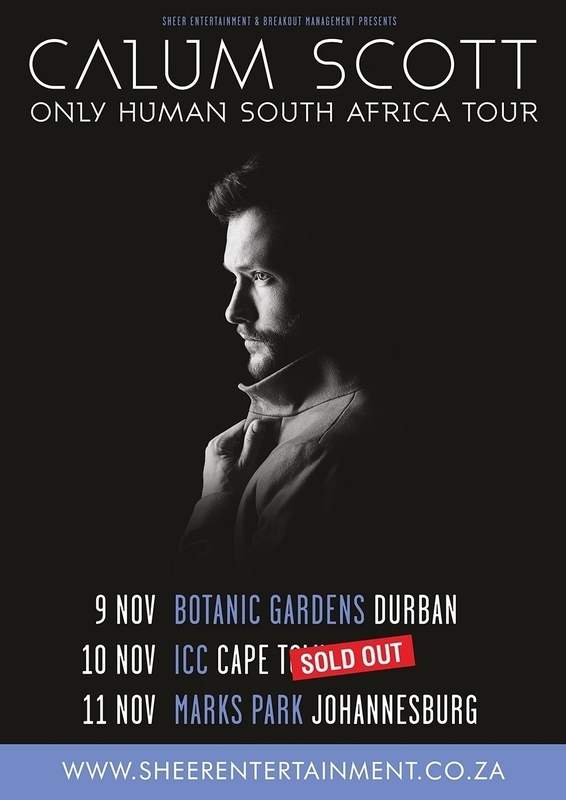 With less than 1 week to go before platinum selling singer/songwriter and Britain’s Got Talent finalist, Calum Scott embarks on his ‘Only Human’ SA Tour, Sheer Entertainment and Breakout are excited to announce the local support acts for the tour. The first show of the tour sees Cape Town trio Opposite The Other join Calum Scott at the Durban Botanic Gardens on Friday 9 November. Durban fans had social media buzzing with the request to have Scott add a date for them on the tour and since the announcement at the end of August, tickets sales have been incredible for the event with just a handful left. The Sold Out Cape Town show on Saturday 10 November has Ben Dey & The Concrete Lions added as support. The final date of the tour sees Johannesburg with 3 support acts for a beautiful day time event at Marks Park in Emmarentia. Majozi, Opposite The Other and Ben Dey & The Concrete Lions will be entertaining fans on Sunday 11 November. Tickets for the Durban and Johannesburg concerts are still on sale here. If you are feeling LUCKY we have 2 x double tickets to GIVEAWAY – enter via our Facebook page. Std. T&C’s apply. Scott’s heart-warming appearance on Britain’s Got Talent in 2015 shot him to instant global stardom, and when he officially released his audition song ‘Dancing On My Own’ as the lead single from his debut album Only Human, it took the world by storm. ‘Dancing On My Own’quickly charted in over 34 countries on Spotify, peaking at No. 1 on the Viral chart in six, including the U.S. Now certified Platinum in four countries, 3 X PLATINUM in South Africa, it was the best-selling U.K. single of 2016 by a British solo artist and was nominated for a Brit Award for Best Single. The song has over 550 million streams worldwide, while views of the video are approaching 225 million. Only Human is the result of a long, cathartic songwriting journey. The album has already gone GOLD in South Africa, with single ‘You Are The Reason’ reaching 3 X PLATINUM in SA. Filled with deeply personal material, Scott’s ability to transform pain into beauty is undeniable, whether he is addressing coming out to his father, unrequited longing, adolescent isolation, or the gratitude he feels toward his sister Jade, who pushed him to sing on stage for the first time and auditioned alongside him on Britain’s Got Talent.